As locally owned, brick-and-mortar retailers who pour our hearts and souls into our communities, we’d like to believe that everyone nearby automatically comes to us for their bike and bike-related purchases. But the reality of the Information Age is that someone who lives right around the corner from your store is likely shopping online right now, and getting ready to pull the trigger on a helmet or lock that’s collecting dust on your shelves. And the worst part is that they often have no simple way—barring a phone call or in-store visit—of knowing you stock it. It’s this confounding disconnect between online search and offline inventory that motivates Locally, a company that’s trying to convert online shoppers into local buyers. How it works is this: When someone uses their device to research or buy a new product on a brand’s website, Locally shows them which nearby stores have that item in stock, so they can go in and complete the purchase. It does this by feeding those retailers’ live inventory data—pulled seamlessly from their POS systems—directly into its partner brands’ online store locators and product pages. Locally already works with nearly 20 major brands in the cycling space, including Giro, POC, Thule, Smith Optics and Yakima, and it’s making a push to add even more from our industry. Not only is Locally offering a hassle-free way to boost your shop’s online visibility, but it’s totally free for retailers to use (the brands foot the bill for the company’s tech). Sound too good to be true? “I totally get that,” says Teddy Schiavoni, the head of business development at Locally, “but we’re not here to screw you.” In fact, the company was founded six years ago by Mike Massey—a third-generation retailer and owner of Massey's Outfitters, an outdoor shop with three locations around the New Orleans area—to market the stuff on his shelves to online shoppers living nearby. And several other staff members, Schiavoni included, are either retailers themselves, or longtime champions of local retail. It all started with a website, Locally.com (now primarily used for optimizing SEO within its network), that was supposed to become a sort of Amazon for local products. “But as things evolved, and you run with what works,” says Schiavoni, “we found that Locally.com could become the pass-through where we turn all of these connections inside-out.” In other words, while the consumer site wasn’t getting much traction, large brands were very interested in using the technology behind it to leverage their extensive dealer networks and compete against the Walmarts and Targets of the world. Not only could they bring their customers increasingly popular benefits like “BOPIS”—Buy Online, Pick-Up In Store—but they could also hand them off at the point of purchase to the knowledgeable experts in their dealer network. Of course, it’s a mutually beneficial arrangement for brick-and-mortar retailers, who benefit from the added online visibility (something the NBDA has been working on with suppliers, via the Buy Where You Ride program and related initiatives) and, potentially, BOPIS. Retail data consistently shows that when online transactions bring customers into a physical store, they’re likely to buy more items (up to 62% of customers do, in fact, according to Order Dynamics). Additionally, Locally uses its website to maximize SEO on behalf of retailers, and offers its tech to retailers as a free ecommerce solution. The “Find it locally” widget appears right beneath the “Add to Cart” button (L); What your shopper sees upon clicking the button (R). When you claim your Locally page, you can add your store’s logo, website, phone number, store hours and social media links, as well as additional locations. 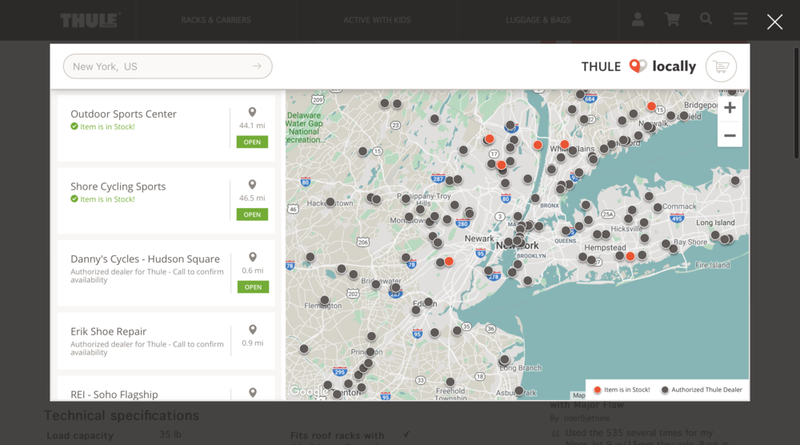 That way, when someone in your area is looking at a specific bike rack on, say, Thule’s website, he’ll see Locally’s “Find It Local” widget right beneath the “Add to Cart” button. When he clicks it, he’ll see that you’re a Thule dealer and be able to directly access relevant store info. If he visits the “Store Locator” page—usually a brand’s second-most visited page, after the homepage—he can click on your store to access all of that rich, relevant info. Benefits: Increased online visibility to consumers—locals especially—researching products and shopping on brand websites, as well as an SEO boost. When you share your inventory with Locally, your store is biased to the top of search results, even if your store isn’t the closest one to the shopper. The next level is to share your inventory with Locally via a seamless POS integration. “We have literally dozens—we’re up to around 50 or so—POS integrations that span across dozens of industries and tens of thousands of retailers,” Schiavoni says. Now your inventory populates directly to brand pages, so that same local who’s surfing Thule’s website can see that you have the item he’s considering in stock, and your phone number and store hours and directions are close at hand to seal the deal. Or, if he decides against that rack, he can easily browse the rest of your available Thule stock. Additionally, to remove as many barriers as possible from the buying process, those stores sharing inventory are automatically biased to the top of search results over closer stores that aren’t. So, if someone one town away is looking for a Thule rack that you have in stock, your store will appear above your nearby competitor that isn’t sharing stock. As Locally adds more bike industry brands, your inventory will automatically feed to their websites, as well. Benefits: Even more online visibility, as well as the ability to easily broadcast your inventory via your website and social media. The highest level of participation with Locally is to enroll in “Buy It Locally,” which allows shoppers to reserve or pay for items for in-store pickup. In this case, the local shopper pays you for the Thule rack, almost as though he’s standing in your store at the cash register, and comes in at a later time to pick it up. At the end of a transaction, he can contact you via the widget to establish a pick-up window (i.e. “I’ll come by after work at 5pm to pick it up.”). Locally reports that retailers enrolled in the program receive, on average, 31 times as many clicks as the rest of retailers appearing on the same brand websites. For accommodating the sale, Locally takes a flat fee of 3.5%. “There are competitors out there who take varying commission rates (depending on any number of factors), and they hold onto your money for 15 or 20 days, which means that you’ve got to go back and try to reconcile your books—it’s a royal pain!” Schiavoni says. “We keep it super simple—it’s 3.5%, you get paid overnight, and you’re done.”The only time you pay for anything is when you move a product. Benefits: The ability to convert sales from local shoppers online, and 24 hours a day. NBDA Board Chair Kent Cranford, owner of Motion Makers in Asheville, NC, is also impressed. “I love features like Locally, that point my customers to my website and show them that I have what they’re looking for in stock.” A self-described early adopter in the bike industry (thanks to brand participation from Yakima), his store nearly doubled its Yakima sales in its first year, and has continued to see increases each year since. “For the brick-and-mortar shop, Locally is literally the best way for them to hold a strong presence on a brand site,” Schiavoni concludes, and he may be right in the near future, if not now. The snow sports industry—where nearly 60 snow sports brands, including industry leaders K2, Salomon, Rossignol, Atomic and Black Diamond (Fischer’s coming soon), have partnered with Locally (hello, bike and ski shops! )—offers a potential window into the future for the bike industry. If that happens, signing on with Locally will be a no-brainer. As it stands now, it sure can’t hurt.